Please note: Aboriginal and Torres Strait Islander people should be aware that this blog post may contain images or descriptions of deceased persons in photographs and (digital) newspaper articles. In addition, this blog post may contain images or descriptions of deceased persons from former secure health facilities in photographs and (digital) newspaper articles. When we look at the distribution of brass bands in Australia between 1900 – 1950 we can see that they mushroomed everywhere. Some towns and localities were lucky to have two or three. Bands merged, split, started and ended, and we know that individual bandsmen were great travellers and had various loyalties. Given the size of Australia it can be assumed that geography was an early challenge – it took a long time to get anywhere and obtain the fundamentals for running a band. Yet the early bands did it and a number of bands survived. This post is about the brass bands that were located on some of the islands that surround Australia. In selecting the islands and bands, I took a punt with some, and accidently found some others. When looking for stories and histories I found that information on these island bands were a bit hit and miss. In some cases, there were only one or two newspaper articles (that I found) where there was only a mere mention of a band. Timelines were difficult to establish but we can get a rough guess based on early articles and later articles. However, the fact that these bands had an existence of sorts only adds to the rich history of bands in this country. I started this post with a disclaimer. The reason for this is that two of the bands were located on islands where Aboriginal missions were established, and another band was located on a small island that once housed a facility for isolating people with leprosy. To delve deeper in the pasts of these missions and this facility uncovered some disturbing facts, as I tried to build a background as to why bands were established in these locations. All locations had unfortunate pasts which will have to be acknowledged in this post, but we recognise that at the time, bands were created similar purpose to those in other locations. This post will address each location, or groups of locations in turn and we will see that the bands in these places were innovative, dedicated and proud. We will also see that they were engaged with island life and that being a band on an island had a special meaning. These bands may not have had the reputation or resources of bigger ensembles, but they did have a certain spirit given to them by their locations. Kangaroo Island, located off the coast of the Yorke Peninsula in South Australia is nominally Australia’s third largest island behind Tasmania and Melville Island (Sealink Travel Group, 2019). At 155km in length and up to 55km in wide it is big in area, but contains only four main settlements, of which Kingscote is the main town (Sealink Travel Group, 2019). The Kangaroo Island Pioneers Association has documented history prior to 1836 however most of the recorded history occurs after this date (Kangaroo Island Pioneers Association, 2019). Last Tuesday, during the luncheon hour, through the courtesy of the P.M. here (Mr. Lamprey), the Kingscote Brass Band played selections through the telephone to Cape Willoughby and Cape Borda Lighthouses. The music was much appreciated by the watchers by the sea at either end of the island. Cape Borda is 70 miles westerly from Kingscote, and Cape Willoughby is about 30 miles easterly. (“MUSIC FOR WATCHERS BY THE SEA.,” 1906). To think they did this in 1906 is quite remarkable and inventive! The activities of the Kingscote Brass Band were mentioned in the local newspaper, The Kangaroo Island Courier in late 1907 where they were noted for wanting to present a program of Christmas Carols and marches on Christmas Eve (“Kingscote Brass Band Items.,” 1907). This is in addition to their fundraising effort for new instruments. In the middle of 1908 the said newspaper received a letter from a mainlander who had read an article in Australian Bandsman about the travel of Kingscote Brass Band members (“ENTHUSIASTIC INSTRUMENTALISTS.,” 1908). In his letter he says, “I think the 12-mile man is the bandmaster and he deserves a lot of encouragement for his trouble” and then proceeds to wax lyrically, “…although I don’t suppose he considers it a trouble, as all men who are interested in their particular band never find anything troublesome where the band is concerned.” (“ENTHUSIASTIC INSTRUMENTALISTS.,” 1908). There you go, we have been told! There is a further mention of the Kingscote Brass Band giving a performance in 1921 where they were noted for showing improvement in their playing (“THE KINGSCOTE BAND.,” 1921). The article mentions that they had been tutored by their former conductor who was visiting the island after a 10 year absence (“THE KINGSCOTE BAND.,” 1921). Unfortunately, due to limited resources it is unclear how much longer this band survived. However, it is clear from this brief amount of information that they were appreciated when they performed. King Island is located in the middle of Bass Strait off the northern coast of Tasmania. It is renowned for its produce although it has never had a big population, there are some well-known localities on the island. It is also known for the ruggedness of its coastline and there are many instances of shipping coming to grief on the rocks. The main centre of population is the town of Currie where they still have a community band. In terms of early brass bands, King Island is unique as there are two brass bands mentioned as having existed in the early 1900’s. Information on this band also comes from an island newspaper, the King Island News and we first see a mention people wanting for form a band in Currie in 1914 (“King Island.”, 1914). Although two years later the Currie Brass Band has still not been founded and the money that was initially raised has been donated to wounded King Island soldiers returning from World War 1 (“No title,” 1916). In 1918 the King Island News reported on the formation of another brass band, this time in the mining settlement of Grassy which is located on the eastern side of the Island (“KING ISLAND.,” 1918). Initially called the Grassy Brass Band, this band was actually set up by the mining company for the recreation of employees at the mine and was known as the King Island Tungsten Brass Band (“KING ISLAND.,” 1918). This band was called for all over the island and in 1919 was noted for its performances of Christmas music in Currie (“No title,” 1919). Again, this is another instance where some history is incomplete as we don’t know for certain when this band stopped operations. While the articles are not listed, the King Island Tungsten Brass Band did numerous engagements on the island and were a valued part of the island community. Phillip Island is an island that occupies the southern portion of Westernport Bay in Victoria and is well-connected to the rest of the state by road and ferry. People might know it because of certain penguins however it has had a long history of settlement and there are several towns on the island with the main town being Cowes. It should be no surprise that a brass band formed on Phillip Island in the township of Cowes. The Phillip Island Brass Band was much more proactive than any other brass bands on Australian islands and were much more well-travelled. They were even proactive enough to enter the South Street band contests on two occasions and took themselves on an educational trip around Tasmania (Royal South Street Society, 1932, 1934; “Visiting Band,” 1947). An effort is being made to form a brass band on Phillip Island. The advantages of such an institution are many. Anything that will encourage the practice of music, especially concerted music, is worthy of hearty support, and the metal and moral benefit derived by any young man who gives his mind and time to learning an instrument is great. (“PHILLIP ISLAND BRASS BAND.,” 1923). The article goes on to note that the promotors of the band were under no illusions as to what they might need in terms of men willing to join the band, instruments, a hall to play in, and a whole host of other items. The Island Progress Association as well as the local council were behind the project and a band was formed. Aside from this they were well-known and in 1935 they were one of the bands to form a Gippsland Branch of the Victorian Bands’ League with other bands from Warragul, Wonthaggi, Korumburra, Leongatha and Dandenong (“Victorian Bands League.,” 1935). Yesterday was an exciting day for Cowes, Phillip Island. Sir Dallas Brooks, Governor, paid his first official visit to the island and almost everybody, including the town’s brass band, turned out for the occasion. The cause and conclusion of this four-year recess might require further research! The Trove archive has some limitations as articles fall into copyright from 1955 so we don’t exactly know when the Phillip Island Brass band went defunct. But they are one of the well-documented bands with further information to be found on the website of the Phillip Island & District Historical Society. Palm and Thursday islands are located off the coast of Queensland with Palm Island near the coast at Townsville and Thursday Island in the Torres Strait off the far northern tip of Queensland. These islands are mentioned because of their unique status as former Indigenous Missions and the fact that both former missions once had brass bands. This post will not go into the pros and cons of Indigenous missions aside to say that they existed and are part of Australia’s history. It was a very different time with different attitudes, and we can only assume that the people who once ran these institutions thought they were doing the right thing by Indigenous people. A brass band was obviously seen as a binding activity and one which other Australians would accept. Unfortunately, language in local newspapers that mentioned the bands were as one would expect from this time. There was interest in the island bands and we see in an article from 1926 published in The Northern Miner newspaper that the bandmaster of The Towers Concert Band visited the island to assist the Indigenous conductor and was duly thanked in a letter from the Palm Island Band conductor (“PALM ISLAND BAND,” 1926). By some accounts, the people of the island appreciated the fact that a brass band, as well as a football team and cricket team had been set up by the Superintendent of the settlement, and certainly these were seen as worthwhile activities (Watson, 2005). In 1927 the football team and brass band visited Townsville and apparently “astonished” the crowd – for both football and music (“FOOTBALL,” 1927). Slightly differently, the Thursday Island Brass Band once included “white and black players” pre-war but was reformed after the war with just aboriginal musicians (“ISLANDERS’ BRASS BAND,” 1952). Both bands were clearly still in operation in the 1950’s, but clearly the novelty of having Indigenous bands had not changed, despite this cited article providing additional information (“‘Band music provides healthy interest for aborigines’,” 1953). In 1954 the Palm Island Brass Band was to be included in a mass-gathering of bands in Townsville to greet Queen Elizabeth (“Townsville Band Festival,” 1954). We can always judge the attitudes of the time as being unfortunate and the language as patronising. We also know that there are still bands dotted across the Top End and some very good music programs that are helping to reform a culture of Indigenous community bands (Cray, 2013; Sexton-McGrath, 2014). In some respects, these former Mission bands as well as other mainland mission bands created a legacy that has given new life to new bands. We come now to Peel Island and Norfolk Island, both very different places yet both have interesting pasts. Peel Island is located in Moreton Bay, Brisbane and is a former Quarantine Station. Yet for many years it housed people forcibly removed from home and family for being contracted with Leprosy. By all accounts this was harsh, isolated, unforgiving and primitive place and it accommodated people from all backgrounds and races (Brown, 2018). The churches were the only organisations to try to bring comfort to the inmates and it is noted in 1928 that one Churchman made an appeal for an Eb Bass for a member of the Peel Island Brass Band (“CHURCH NEWS.,” 1928). This is the first evidence we have that there was a band of sorts on Peel Island and newspaper articles sporadically reported on the various iterations of the band (“SIDE DRUM WANTED FOR PEEL ISLAND’S BAND,” 1945). Likewise, there are also reports of bands visiting the Island to entertain the inmates – the picture below is of a Salvation Army band visiting Peel Island in 1920 and in 1939 the Brisbane Juvenile Band was part of a concert party (“Concert At Peel Island,” 1939). Norfolk Island is another place with a very interesting past and the inhabitants are extremely proud of their history (Low, 2012). Located off the coast of NSW, the inhabitants display a very independent streak, despite their association with Australia. Which makes it all the more interesting that there is mention of a brass band that once existed on Norfolk Island. There is not much to indicate the brass band existed apart from rare mentions in Australian newspapers. We see mentions of a band in 1904, 1905 and 1926 where they are mentioned as being in attendance at official events and for rehearsing every week (Barnes, 1926; “NORFOLK ISLAND.,” 1904; “NORFOLK ISLAND.,” 1905). It is unclear when the Norfolk Island Band officially started or ended. It is quite clear that these early brass bands of our islands had their own unique histories, although one might call them quirks. While there are many similarities to other bands located on the mainland, the isolation and geography meant they had to be innovative and were also part of their communities. It is fortunate that we can read about them now and wonder at their existence. The knowledge that some of them existed in questionable environments is also a wonder but also indicates that they were a sign of the times. We appreciate that these bands were part of a greater movement and that we can acknowledge the history. If there is one longstanding event that has been synonymous with bands, it would have to be the South Street competitions. There have been whole generations of bands people who have made the journey to Ballarat to participate in competition, and when the bands sections were introduced, they were extremely popular with the crowds. Such is the reputation of South Street that the first band contest in 1900 attracted two bands from other colonies. Remembering that this was Australia in 1900. The separate colonies had contingents over in South Africa for the Boer War, cities and towns were much smaller, transport networks consisted of railways, ships and mostly dirt roads. Yet brass bands thrived where they were established due to otherwise limited entertainment. Ballarat at the time was lucky to have three! While the story of this first South Street contest will focus primarily on the bands and results, there were some other stories to come out of this event and newspaper articles of the day reported on all sorts of angles – reactions from townspeople, travel, and even the voices of local Churches contributed opinion. Thankfully we can see these early articles through the Trove archive. What started from this modest event is still evident today with bands travelling to the South Street event and carrying on the history of the bands people before us. Many of the most famous brass band composers, adjudicators, conductors, musicians, and bands from around Australia are associated with South Street in some way. Their legacy will not be forgotten. The South Street events were famous even before the band sections were added to the program. The origins of the competitions can be traced back to 1879 when eight young men, none over the age of seventeen decided to form a debating society (Blackman, 1966). The society was very successful in gaining members and funds, and were eventually able to own their own building (Blackman, 1966). However it wasn’t until 1891 when the first debating competition was held, and from this first event, subsequent competitions were held and other sections were added (Royal South Street Society, 1979). In terms of music, the early Society started holding Monday night concerts in 1893 where many songs were sung and they audiences were extremely appreciative (Blackman, 1966). In 1896 the final concert for the competitions in that year were held in Her Majesty’s Theatre for the first time (a venue bands people know very well) and in 1897 the first choral competitions were held (Blackman, 1966). A year later solo singing was added as a section and with these new sections, the time period for the competitions was extended and three venues across Ballarat were used (Blackman, 1966). In 1899 Alfred Hall brought into use as a dedicated venue because of large and appreciative crowds (Royal South Street Society, 1979). And in 1900, the first brass band sections were introduced into the program with immediate success (Royal South Street Society, 1979). By the 1870’s, bands were features of the Ballarat scene. However, it was the German combination known as Baulch’s Band which first brightened the local processions and played at important functions. Then came Apps Soldiers’ Hill Band, and a couple of other minor combinations. Interest slackened in the 1880’s, and at the turn of the century the musical reputation depended on the famous Prout’s Band and the City of Ballarat Band. Later the Ballarat Orphanage and St. Joseph’s Home Bands had brief periods in the limelight (pp. 6-7). With this in mind, the progression of the South Street Society was to add brass band and brass solo sections to the programme of events with sections to be held on Friday the 5th of October and Saturday the 6th of October (“THE SOUTH STREET COMPETITIONS.,” 1900). The competition was divided into four sections; the first part of a Selection Contest and a Solo Cornet contest to be held on the Friday and the second part of the Selection Contest and a Euphonium Solo contest held on the Saturday (Royal South Street Society, 2018a, 2018b, 2018c, 2018d). An aggregate score was calculated to decide the winner of the selection contests with the leading band declared on the Saturday (Royal South Street Society, 2018b). All full band sections were held at the City Oval while the solo sections were held at Albert Hall. Nine bands competed with seven coming from Victoria, one from Tasmania and one from New South Wales (Greaves, 1996). In the history of the Royal South Street Society, it is written that “15,000 people thronged the City Oval for the closing scene of the Band Contest” (Royal South Street Society, 1979, p. 6). It is known that the first band contest at South Street was a huge success but despite this, there were some pockets of resistance to having it held in the first place. Although not directly related to the competition itself, the churches were not happy about bands occupying the City Oval two Sundays in a row which was perhaps understandable for the time (“BAND PLAYING ON SUNDAY.,” 1900). 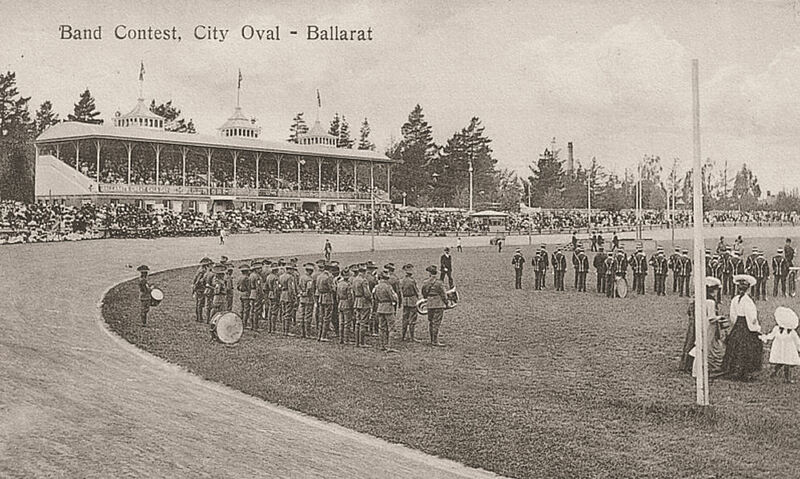 On the weekend before the competition, the resident Ballarat band Prout’s Brass Band had played at the City Oval to provide support for a statue to be built commemorating the soldiers from the Boer War. The Reverend of the Scots Church complained bitterly of this event, but in the same article took aim at the fact that some participating bands would be again taking to the City Oval on the Sunday 7th of October for another commemorative event. The performances on the Sabbath, as he “pointed out, was for a purely secular purpose, and like all of its kind of the Lord’s day was inimical to the welfare of the community, and had a very bad effect on Sunday school children” (“BAND PLAYING ON SUNDAY.,” 1900). The fact that this first event was attended by 3000 people and raised over £50 obviously escaped the notice of the churchmen. A more pragmatic letter was published in The Ballarat Star newspaper on the 4th of October 1900 by a G. H. Smith. He concedes that not all in the local Chamber of Commerce were happy about a public holiday being granted on the Friday for the purpose of the band competition. However, he waxes lyrical about the very positive effect bands have on the populace due to their sound and the many benefits the South Street Society brings to Ballarat on a whole (Smith, 1900). On arrival in Ballarat it was quite usual for visiting bands to find swarms of people crowding the railway station awaiting their appearance and, after listening to speeches of welcome by civic dignitaries and contest officials, these crowds would then follow the bands to their respective hotels. Sometimes the bandsmen would avail themselves of transport in the form of horse-drawn drags made available to carry them to their hotels or other places of accommodation. On most occasions though, the bands would elect to form up and, as the Adelaide Observer reported in 1902, “march to their hotels, to the strains of lively music, that attracts a customary following, brought up in the rear with a miscellaneous assortment of small boys and a stray dog or two. Even the latter possess a sort of musical instinct in Ballarat (p. 31). It seems Ballarat had no shortcomings in accommodating and promoting the band competition, not only for the bands, but for the people themselves. The enthusiasm was palpable, and Ballarat was festive. As mentioned, huge crowds flocked to the City Oval to watch them march and play. And just to make sure people arrived in Ballarat and enjoyed themselves, The Herald reported on October 5th, 1900 that, “A public holiday has been proclaimed and is being generally received. Excursion trains have been run for thirty or forty miles round, and these are being well patronised” (“HOLIDAY AT BALLARAT.,” 1900). Of course, the competition would not have been a competition without the bands themselves. The nine bands that took part were – Ballarat Militia Band (3rd Battalion), Bathurst District Brass Band, Bulch’s Model Brass Band, Eaglehawk Citizens’ Brass Band, Geelong Town Band, Hopetoun Brass Band, Launceston Garrison Brass Band (2nd Battalion), The Lord Nelson Mine Band & Prout’s Ballarat Brass Band. Three of the bands were based in Ballarat which gave them a distinct home town advantage, and home town rivalry. Two were from interstate while one came from Geelong, one from St. Arnaud and two from the Bendigo area. It made for a full competition for the times. In addition, there were two solo contests which attracted entrants from the aforementioned bands including a Cornet player by the name of John. F. Code from the Albert Park Band (more commonly known as Code’s Melbourne Band) (Royal South Street Society, 2018c). It was known quite early on which bands would be attending due to details of the South Street events being published in newspapers (“THE SOUTH STREET COMPETITIONS.,” 1900). Interest in the bands was high, so in the days before the competition took place it was not unusual to read little snippets of the arrival of bands and the reception they received. An example of this (pictured) appeared in the Bathurst Free Press and Mining Journal on October 4th (“To-Day’s Telegrams.,” 1900). Interestingly, there appears to be no mention of the Launceston band arriving in Ballarat in the Tasmanian papers although details of the competition were published in their local newspapers. Bathurst District Band, the only entrant from New South Wales, and a runner up in the quickstep contest, found themselves to be quite popular in Ballarat and they were asked to return the following year. Their conductor Sam Lewins, had to decline because of the expense and distance involved but suggested that the society contact the Newcastle City Band a much better combination, he assured them, than the Bathurst Band (p. 29). Bathurst Band also won praise for participating in the services at the City Oval on October 7th with other bands that had participated in the competition (the same service that was criticised by the Church). A letter was sent by J. W. Nedwell and W. D. Hill, the Honorary Secretaries of the Soldiers’ Statue Fund to the Bathurst National Advocate newspaper, published on October 22nd where they thanked Bathurst Band and the other bands for their performances (Nedwell & Hill, 1900). We were informed that it has been rumoured in certain quarters, especially in Eaglehawk that the Eaglehawk Brass Band while in Ballarat last week competing for the band prizes, were guilty of conduct which incapacitated them from winning the prize. One allegation was that they found Ballarat ale so enticing as to imagine that it had been specially brewed for them. (“A BAND THAT FAILED.,” 1900). …he observed the men of the Eaglehawk Band on several occasions, and he heard nothing but praise for them all the time, and whoever started the slander ought to be “ducked” in a horse trough. The people of Eaglehawk, he says, should feel very pleased with the behaviour of their bandsmen on their visit to Ballarat (“A BAND THAT FAILED.,” 1900). It appears that there was no instance when the Eaglehawk Citizens’ Brass Band was inebriated while competing, or in any other occasion. The headline of the article is unfortunate and misleading. In 1900, travel around the Nation cannot have been easy or cheap, so just getting to Ballarat was an achievement in itself. The early railways were a lifeline which enabled bands and spectators to descend on Ballarat. The Bathurst band were probably over travelling and trains when they finally arrived back home. As can be read in the cited article from The Ballarat Star, October 8th, criticisms were mixed about the playing of the bands. Given that these were early days of Australian bands, with instruments that were not the quality they are now, the playing can only be imagined. Greaves (1996) writes that “…with the exception of the winning combination, “untunefulness”, according to the judges’ reports, was a common fault in the playing of all the competitors.” (p. 29). The selection of music was the norm of the day with many bands playing arrangements of Operas for their selections and early marches for the Quickstep. Of the Second Battalion, I have only to say that they deceived me in saying they could play their parts in the quickstep without the music, and which is verified by the judge’s remarks, vis., that the music was wrongly interpreted. Outside the music they could have got but few points for their general appearance, the stained and worn-out state of the Government uniforms being severely condemned by the military judge (“THE INTERCOLONIAL BAND CONTEST.,” 1900). Not much comment is made on the solo Cornet and Euphonium competitions aside to note that they took place – the newspaper articles of the day merely listed the results. Although Mr George Harrison, commenting on the Cornet contest said that. “The contest was most farcical, not a single competitor giving an acceptable performance of the test piece.” (“THE INTERCOLONIAL BAND CONTEST.,” 1900). Duly noted, however the comment was a bit harsh for the time – I’m sure all soloists played to the best of their abilities. One must give credit to these early bands for competing at Ballarat and establishing and early benchmark in competition for subsequent years to follow. Perhaps the early conductors saw this as a learning experience but there is no doubt that rivalry was entrenched in the early bands, despite there being a level of comradery as well. It would have been an amazing experience to step back in time and view this first competition. No doubt that we would have been astounded by the crowds and festive atmosphere, the bands, the playing and the whole spectacle. For a first contest it was a huge success with everyone in Ballarat, and beyond, making it a success. Giving that it was billed as ‘The Intercolonial Band Contest’, it probably didn’t live up to its full potential given that only two interstate bands played. Yet it set the scene for future competitions and the reputation spread. It is a credit to these early organisers that it happened and gave us what we now know today. Blackman, L. A. (1966). A history of the Royal South Street Society of Ballarat. The Victorian Historical Magazine, 37, 5-21. Greaves, J. (1996). The great bands of Australia. Australia’s heritage in sound [sound recording .]. Australia: Sound Heritage Association. Royal South Street Society. (1979). Royal South Street Society, 1879-1979. Ballarat, Vic. : Royal South Street Society. It is a massive undertaking to take any musical group on tour which stands true even today. But let’s examine these undertakings from another time. When we look back at the grand tours of brass and military bands in the early 1900’s, we can only marvel at the schedules they set for themselves, the places they visited, and the effect they had on local populations. Australians it seemed had an insatiable appetite for viewing the best in the business and visiting bands were not disappointed when they toured here. Visiting bands did not come all the way to Australia just to return home again. Often, Australia was just one stop in a round the world tour. From reading the Trove archive we can see that the movements of the bands in foreign countries was eagerly reported on because Australians knew they were next to see them. And when the bands did arrive in Australia, each concert was widely advertised. This was a great age of Australian and World banding. It must have been quite a sight too when each band was alighting from ships and trains which were eagerly awaited on by an adoring crowd. Parades of massed bands, dinners, receptions, concerts, photographs, articles and other events all greeted visiting bands when they stepped upon our shores. Thankfully our libraries hold some ephemera and newspaper articles from those tours, so we can imagine just what it would have been like. This post will highlight some of the visiting band tours and will see that some bands had vast reputations which preceded them. However, the famous bands were not the only groups to visit. This post will not cover all tours or bands. Undoubtedly there might have been other bands that visited that are buried in time (more stories to uncover). However, for the bands that did visit, their tours last in memories, and even in some of the local bands that were beneficiaries of the expertise of visiting bandsmen. There are some fascinating stories that surround these tours. Immediately they alighted from the Sydney express the visiting bandsmen stepped across the platform into the railway yard and as they did twenty-two bands, under the conductorship of Mr. E. T. Code, commenced to play an inspiring march. Each man in those twenty-two bands contributed his full share to the volume of sound the like of which has rarely been heard in Melbourne. […] A procession was formed and heralded by the twenty-two local bands, the Besses o’ th’ Barn Band were drive up Collins Street in two drags. The street was crowded with citizens whose curiosity had prompted them to see the famous bandsmen at first opportunity. Regarding the huge crowds, an 1907 article in the Quiz newspaper from Adelaide which reported on the progress of the Besses tour thus far, noted that 70,000 people lined the parade route in Melbourne, which is a staggering amount of people for this kind of event (“Besses o’ th’ Barn Band,” 1907). Such was the popularity and reputation of this ensemble. However, Besses did not finish touring after this first monumental effort. Not one year after they had arrived back in England, the band embarked on another world tour (“BESSES O’ TH’ BARN BAND,” 1909). As noted in their band history (2018b), “Both trips lasted an incredible eighteen months.” (Besses o’ th’ Barn Band) which was a very long time for bandsmen to be away from home. Needless to say, Besses had not lost any popularity on their next world tour and again drew large crowds whenever they went. Interestingly it was on their second tour where there were some changes in the Besses personnel due to a bandsmen staying on in one city, and another bandsmen joining them on their tour. In a previous post we can read the story of Besses Lead Cornetist William Ryder who absconded from the tour in Melbourne and joined the Wests Theatre Company before becoming the first conductor of the Prahran & Malvern Tramways Employees Band in 1911 (de Korte, 2018; Stonnington City Brass, 2018). This being done, it appears that Besses invited one of our most famous bandsmen, Percy Code to join them on the rest of the tour (Bradish, 1929; Gibbney, 1981). The conductor of Besses during this world tour was Mr Christopher Smith and after the tour ended he was secured by the Adelaide Tramways Band for his services in 1911 (Seymour, 1994). There is no doubt that Besses left their mark on Australian banding and were adored by audiences. Certainly, in the succeeding years, many fine Australian bands dominated the landscape and as we saw some ex-Besses musicians now called Australia home. Besses was one of the first bands to include Australia in their tour, but they were not the last. Next to tour was the famous Sousa Band from the USA! 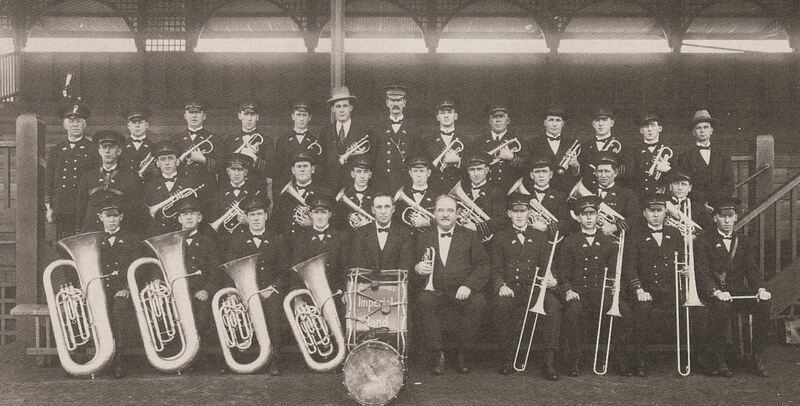 The band of John Phillip Sousa was no less famous than the Besses band, although much bigger with sixty musicians and some additional soloists in their touring party. They toured Australia and New Zealand from May 12th to August 23rd 1911 and like the Besses band generated huge excitement wherever they went (Lovrien, 2012). In fact, the excitement had started brewing before they had even arrived with newspapers reporting expected arrival dates and schedules (“SOUSA’S BAND.,” 1911). As with the Besses tour that had just finished, the Sousa band was feted with ceremony, functions, awards, parades and large audiences – upon arriving in Sydney there was a grand parade featuring twenty NSW brass bands (“SOUSA AND HIS BAND,” 1911). Inevitably, given the timing of the Sousa tour to the previous Besses tour, questions were asked as to which the finer band was. In an article from May 1911, the World’s News newspaper sought to answer this question from a reader (“Sousa’s Band,” 1911). The article reported on the differences between both bands and diplomatically opens the article by declaring that: “Comparisons are odious in connection with bands, as well as with politics” (“Sousa’s Band,” 1911). However, it came down to the fact that one was a brass band as opposed to a military-style band and one band was much bigger than the other. Musically, they were both very fine ensembles. The Sousa band was a very different ensemble and they enthralled Australian audiences. However, there is no real indication that the Sousa band had an influence on Australian bandsmen, and if they did, it was not reported. One could assume the reason was that Australian bands, which were mostly brass at the time, were very much tied to the band tradition of England, not the USA. From Australia, the Sousa Band travelled to New Zealand where they again delighted audiences and received rave reviews (White, 2018). And after this swing through the Southern Hemisphere, they returned to the mainland USA via a visit to Hawaii (Lovrien, 2012). The Sousa tour, despite the amount of places that they visited and the largeness of the audiences, did not generate a huge financial windfall and it was very expensive to take the band around the world (Lovrien, 2012). 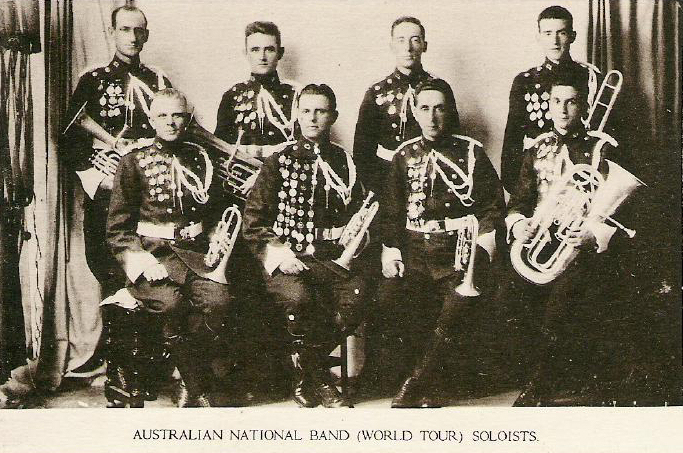 However, in 1913 a court case was heard regarding the profits from the Australian leg of the Sousa tour. From the brief flurry of newspaper articles that were written at the time, it appears that a series of contracts was entered into by the promoter of the tour, Mr Branscombe with a Mr Quinlan, and later a Mr Singer over £30,000 in profits (“SOUSA’S BAND IN AUSTRALIA,” 1913). It is interesting that this case was heard two years after the tour had finished, and that these profits were not intended for the Sousa band itself. Bythell (2000), writing on the band tours and exchanges between countries during this time says that “…the logistics and high costs or international tours and exchanges made them exceptional” (p. 229). Certainly, it was noted in the New Zealand article on the Sousa visit that the tour (through Aus. & NZ) was costing “over £2,000 per week” (White, 2018). Given the logistics of moving a sixty-piece band plus soloists around the Australia and New Zealand, this figure is hardly surprising. Despite this, the Sousa tour appears to have been a success for the band and audiences as Sousa was a renowned conductor and composer. The time frame between this tour and the previous Besses tour had not dimmed the enthusiasm of the Australian public in wanting to see these kinds of entertainments. The Sousa band did not disappoint. A Belgian Band comprising some of the finest instrumentalists in Belgium, has been engaged by J. and N. Tait for a tour of Australia and New Zealand, commencing in June. […] After considerable trouble, many cables and much correspondence, the band has at last been got together, and will prove on its arrival one of the finest aggregations of talent that have yet visited Australia. The band comprises of 28 instrumentalists, recruited from the foremost bands of Brussels, Antwerp and Ostend, and augmented by half a dozen English players, and will be conducted by the brilliant M. Phillipe Meny, a remarkable musician, whose reputation is not only Belgian, but European. (“MUSIC.,” 1915). The reaction of the Australian press to this visit was understandable. A number of articles expressed admiration that the musicians had actually left Belgium, while also expressing sympathy and solidarity with the Belgian people under German occupation. An example of this kind of article was from the Daily News in Perth (“THE BELGIAN BAND.,” 1915). 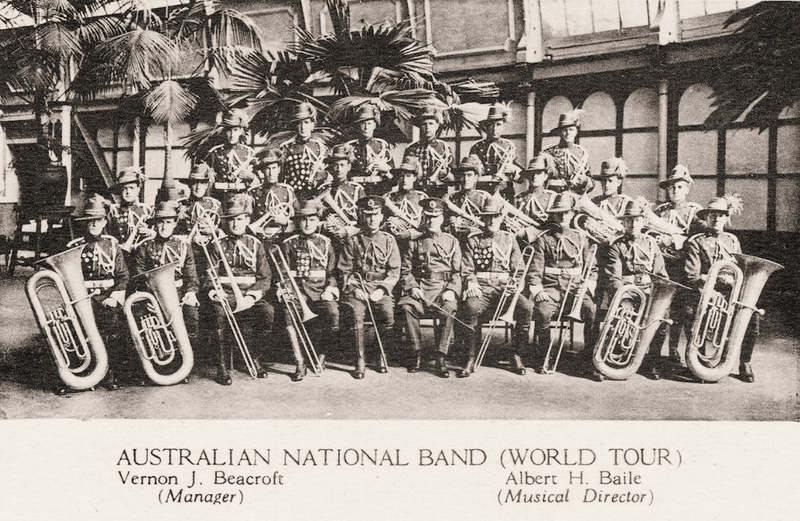 Notwithstanding the circumstances of this visit, the band drew the interest of an Australian public and received good reviews for their performances (“Visit of Belgian Band,” 1915). In an act of decency, the band promoters donated all profits to “…the Belgian Relief Fund and the Wounded Soldiers Fund” (“BELGIAN BAND VISITS AUSTRALIA.,” 1915). After the war, visits from overseas bands resumed quite early on with a visit from the Royal Marine Band, H.M.S. “Renown”. This band was brought to Australia by J. and N. Tait, the same promoters who engaged the Belgian Band in 1915 (“RENOWN BAND.,” 1920). The Royal Marines actually visited twice; their first visit was in 1920 and they followed up with another visit in 1927. The concerts of 1920 received some very favourable reviews with one article printed in the Argus praising the sound and playing of this ensemble, and making a comparison of conducting styles with the great Sousa (“Concert by Renown Band.,” 1920). On the second tour, a concert in Melbourne was presented as a massed bands concert in combination with the “Returned Sailors and Soldiers Memorial Band” and the “Victorian Railways Military Band” with the Lord Mayor’s Hospital Appeal Fund being the beneficiary of the proceeds from the concert (“FOR MAYOR’S FUND,” 1927). In 1934 the Band of the Grenadier Guards visited Melbourne as part of the Centenary of Victoria celebrations, with a subsequent tour of Australia as well. There was some initial confusion as to which Guards band was going to visit the with the Grenadier Guards, Coldstream Guards and Welsh Guards being mentioned in some press (“GUARDS’ BAND VISIT.,” 1933). It seems there was also some objection to the tour on the part of the Musicians’ Union. A letter to The Herald in September 1933 berated the Union for their stance with the writer stating that “Their visit will be education and beneficial to our unemployed musicians.” (Musician, 1933). A visit to Australia by a band of this calibre was beneficial to all who witnessed them (not just unemployed musicians). The band made a special appearance at the South Street competition of 1934 with a concert presented to an appreciative audience which included the Duke of Gloucester who was also visiting Australia (“South-street Band Contests.,” 1934). These two British military bands were highly regarded, and it appears that their tours were more genuine with concerts in combination with Australian ensembles and presenting inspirational performances. There was no comparison with the previous tours of Besses and Sousa as these were again, very different groups. However, Australians were no less enthusiastic about the visits of these bands and made them feel very welcome. What we have seen here is only a small sample of the bands that visited Australia within a shorter time frame. Each group was very different, yet they elicited an amount of excitement from the Australian audiences, bandsmen and public authorities. Yes, they were expensive undertakings. But musically they were invaluable. This truly was a great age of banding. Bythell, D. (2000). The Brass Band in the Antipodes : The Transplantation of British Popular Culture. In T. Herbert (Ed. ), The British brass band : a musical and social history (pp. 217-244). Oxford: Clarendon Press ; New York : Oxford University Press. Seymour, C. (1994). Adelaide’s Tramway Band. Trolley Wire, 35(4), 3-10. 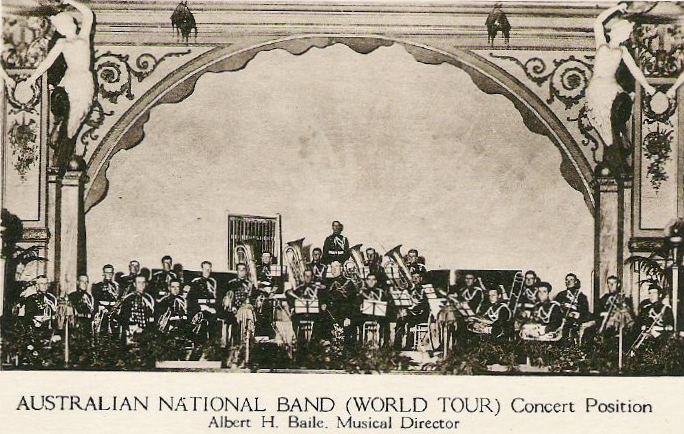 Postcard of the A.B.C Military Band. Possibly in 1930 or 1931. To view the early history of bands in this country would be to see a history that is based around brass bands. This was no accident as much of the brass band culture was imported into the Antipodes by early settlers from the United Kingdom (Bythell, 2000). However, in amongst this brass band culture there were a few oddities in the form of military bands – bands that included woodwinds. They were a rarity, but they certainly existed. One of the most famous groups was the A.B.C. Military Band which was only in operation from 1930 – 1951. This ensemble built an enviable reputation for their playing, sound and demeanour. Military bands were not new ensembles in Australia, certainly not in name. But the A.B.C. Military Band accomplished much more than previous ensembles, no doubt partly due to the broadcasting resources of the A.B.C.’s radio network. Also, it provided many musicians with a unique employment opportunity, guidance by the best wind band conductors that could be found, and a large following through Australia. This post will delve into the short history of the band with material mainly found through the Trove archive and will highlight some of the more interesting stories of this ensemble. Depending on which history is read, most will say the band started in 1933 however this isn’t the case as it essentially started in 1930. There are only limited photos of the band that seem to exist which are displayed with this post. Unfortunately, the band is no longer part of the musical landscape, so we have only articles and photos that preserve the memory. And as will be seen, in the end the ensemble was closed due to reasons that are only too familiar today. To start this small history, we need to see what the A.B.C. was doing regarding the running and broadcasting of its own ensembles. From using the Trove archive, we can find that in-house ensembles were barely getting started, if they existed at all. Interestingly there was one that stood out. In 1929 the Table Talk newspaper published an article on the famous conductor Percy Code, who was an eminent bandsman and composer. Percy, in amongst his other musical activities, was conductor of the 3LO Orchestra which was labelled as being the “National Broadcasting Orchestra” – the A.B.C., at the insistence of the Government, had taken over several radio services and when taking over 3LO had gained an orchestra as well! (Bradish, 1929). Unfortunately this article is the only mention of such an orchestra although 3LO broadcast many forms of music during this time, including brass bands (“3LO.,” 1929). In 1930, articles first start appearing mentioning a newly-formed A.B.C Military Band. Although, just about all of the articles only provided details on when the band could be heard on the radio (“MILITARY BAND AT 3LO.,” 1930). What we do know is that the great Harry Shugg, the famous conductor of the Malvern Tramways Band, was the first conductor of the band in 1930, a position he apparently held until 1933 (“CONDUCTOR AT 18.,” 1931). The Postcard at the start of this post shows him in front of the band in what looks like a recording studio. This time period was perhaps the most interesting for the A.B.C. Military Band with superb guest conductors, a new focus on musicality and National tours (Ken, 2012). In November 1933 the A.B.C. assembled 40 musicians from around Australia to form a new Military Band, which, according to the article, was only supposed to be engaged for 10 weeks (“A.B.C. MILITARY BAND.,” 1933). They were initially conducted by their deputy conductor, Mr R. McAnally (another prominent bandsman), until the guest conductor Capt. H. E. Adkins, the then Director of the Royal Military School of Music, Kneller Hall, commenced his position (“A.B.C. MILITARY BAND.,” 1933). Capt. Adkins arrived in Australia in December 1933 and immediately started conducting the band. He apparently had trepidations over what he was about to do, but was quickly won over after his first rehearsal with the ensemble (“A.B.C. BAND,” 1933). When speaking at a club in Sydney about his initial experiences with the band, he said that while on his way out from England, “I had a feeling of anxiety, but it disappeared after our first practice yesterday. I was very agreeably surprised, and in a few months’ time the band will be the equal of any in the world” (“A.B.C. BAND,” 1933). The band commenced touring around Australia and the choice of Capt. Adkins as Guest Conductor won praise in many places. The Evening News from Rockhampton was one newspaper that published an enthusiastic article by stating at one point that Capt. Adkins , “…is recognised as the world’s greatest authority on wood-wind instruments” (“A.B.C. National Military Band.,” 1934). Likewise, a reporter with the pseudonym of “G.K.M.” writing for the Weekly Times newspaper congratulated the A.B.C. and noted that Capt. Adkins “…is setting a new standard for Australian bandsmen.” (G.K.M., 1934). A month later the Weekly Times published a picture of Capt. Adkins at his farewell from Australia (“The Adkins Way,” 1934). A later article from 1941, published in the Portland Guardian after Capt. Adkins had left the band (and Australia), followed through on some of memories and anecdotes of his tenure in front of the band. We see a bandsman who was brought out to bring an ensemble up to a very fine standard of playing – and that’s exactly what he did! Cleve Martin, now deputy-conductor, and E Flat clarinetist under Adkins, is one who remembers the swaggering, lovable, downright English band-leader. That first remark from Captain Adkins was typical of his downright ‘take no nonsense’ style,” says Cleve Martin. It was a blitz beginning with the Empire’s No. 1 bandsman, but the players soon became used to his roars and worked hard to give him the precision that he sought. He was truly loyal to this band, so much so that he could not say goodbye to them in person when it was time to go. His comradeship with the National Military Band was staunch. Beneath the brusque sergeant-major manner was a soft nature. He demanded the best possible playing, but also worked himself, and was deeply appreciative of the band’s response. He expressed his attitude in a farewell wire to the band : “Sorry I failed to see you off. At the last moment I realised I could not face it.” At the hotel that night, someone noticed that he was on the verge of tears. Having finished his guest appointment, Capt. Adkins returned home to England and Stephen Yorke resumed his direction of the band. ABC Military Band playing with ABC commentator on a vessel. As with any organisation of its size, the A.B.C. was not immune to industrial trouble and in the middle part of 1934 there was a court case over the rate of pay for the Military Band musicians (“IN THE LAW COURTS,” 1934). Stephen Yorke had taken over as conductor by this time and was asked to give evidence in court. The crux of the issue was over which players in the band deserved extra remuneration as the court had decided that the band was like an orchestra with actual principal players. Mr Yorke apparently stated that any player in the band could be considered a principal player as they all played some kind of solo part – but he didn’t have knowledge of the industrial award that distinguished between “leaders” and “principals” (“IN THE LAW COURTS,” 1934). Whereas the Musicians’ Union countered that the principal players should be the first player of any class of instrument, and any single players of an instrument (“IN THE LAW COURTS,” 1934). Capt. Adkins in his treatise had said that “the oboe was essentially a solo and color instrument. Therefore an oboe player must be called upon at times to perform work comparable to that of a principal.” (“IN THE LAW COURTS,” 1934). The final decision was that the commission followed the argument put forward by the Musicians’ Union where the principal players were the first players of a group of instruments and any player of single instruments were considered to be the principals (“IN THE LAW COURTS,” 1934). In the year of 1936 we see the band, under the baton of Stephen Yorke continue their series of broadcasts, concerts and other engagements around Australia. Under Mr. Yorke the reviews indicate that the quality and standard has not diminished, and they are receiving rave reviews (“A.B.C. Military Band.,” 1936). Unfortunately the A.B.C. raised the ire of some listeners who wanted more brass band music to be played, and berated the A.B.C. for putting on the wrong kind of music –they expressed support for regular performances of the military band as well (“A.B.C. Neglects the Bands.,” 1938). In 1939 the Second World War started, and the Military Band was there to lift the spirits of Australians over the radio with patriotic music. As can be seen in the article here published by the Shepparton Advertiser, it enthusiastically endorses the music played by the band on the radio for lifting spirits of all Australians (“NATIONAL MILITARY BAND SESSIONS,” 1941). A brilliant young musician, he took two scholarships at the Sydney Conservatorium for clarinet playing, and was considered one of the finest artists on that instrument in Australia. Graduating from the Conservatorium, he went straight into the A.B.C. Military Band. At the time of his enlistment he was a member of a leading Sydney theatre orchestra. About 12 months ago he went overseas with a battalion of Pioneers, and served throughout the Middle East. Sadly, it was through doing this job that Smith lost his life. After the conclusion of hostilities we see the band resume its normal activities of performances and broadcasts which continued through the rest of the 1940’s (“A.B.C. BAND CONCERT,” 1946; “A.B.C. BAND RECITAL,” 1948). Stephen Yorke was still the conductor of the band. As another measure of the quality of musicians that were associated with the band, one of them was Tuba player Cliff Goodchild. Cliff’s first real musical position was with the A.B.C. Military Band and after the band ended he gained a position with the Sydney Symphony, a position he held for 36 years (Veitch, 2008). He was also a consummate bandsman and over his lifetime held positions as “Secretary of the National Band Council of Australia, President of the Band Association of NSW, founder and co-organiser of the NSW School Bands Festival and formed a number of bands, including the Waverly Bondi Beach Brass Band and the Sydney Brass” (Veitch, 2008). In 1951, we see that funding cuts brought about by the Australian Federal Government of the time leave the A.B.C. no choice but to close the band (“A.B.C. Band’s Farewell,” 1951). This was a bitter end to a no doubt special period in Australian ensembles where we had a band that was excellent in its playing and revered throughout Australia. At the final concert in Sydney, conductor Stephen Yorke thanked the band and the audiences for their appreciation of the ensemble (“A.B.C. Band’s Farewell,” 1951). By all accounts this was a truly remarkable band; the finest musicians from all over Australia brought together under various conductors and being boosted to higher and higher levels. A band that all Australians supported and were proud of. We see the high praise given to the conductors and musicians and with the broadcasting resources of the A.B.C., the sound of the band is heard Australia-wide. From reading the articles of the time, we just have to wonder why they would cut such a fine ensemble? But as we know, governments change and priorities change. Who knows what the band could have become had the Federal government of the day not enforced funding cuts? Canberra is a unique city as it was fully planned and designed wholly to house the seat of Federal Government in Australia. By Australian standards it is also a very young city having only been in existence just over a century. It stands to reason that any artistic groups that are located in Canberra are also very young. Having visited Canberra recently, I did some thinking about the other bands that most likely existed in towns around Canberra, and then it was a matter of finding them. After visiting local libraries, it surprised me that there is not more history on these groups. However, some historical snippets clearly exist. It is a matter of putting them all into place. The purpose of this post is not to redo the history of the Canberra City Band as there is already an excellent history of the band, Mr Chifley’s Baby: The Canberra City Band written by William Hoffman OAM and John Sharpe. Rather, this post will provide an overall view of banding in this area of New South Wales and the ACT with the aim of showing the development of the Canberra City Band in context. Around Canberra in the local towns and regional centres there were a number of brass bands, so the cultural knowledge of brass banding was already in place when the building of Canberra commenced. Interestingly, none of the other bands seemed to have the longevity that the Canberra City Band now holds – perhaps this is a benefit of starting at a later date…? Within this region, as can be seen by the map below, there is the typical layout of country Australia with regional centres, rural towns and other localities. And then there is Canberra, the seat of the Federal Government and a city in its own right. Quite a few of these towns are famous having gained their reputations for being railway towns, centres of Shires, being near stunning natural geography, or sitting on transport routes and rivers. Nowadays with the main highways bypassing these towns they are still famous for historical architecture, arts, museums…the list goes on. The railways had their part to play with many towns located on the Main South railway from Sydney – Melbourne via Goulburn and Yass. Or they were located on the line from Goulburn to Bombala that went via Bungendore and Queanbeyan. The only working part of this line is now from Goulburn – Canberra (Gee, 2017). With this proximity to transport, people travelled, and news spread. As populations grew, so did the services and with these settlements came local brass bands. To place a geographical boundary on this post, the focus stretches from the tiny locality of Nimmitabel in the south, to Goulburn and Yass in the north and from Braidwood in the east with Canberra roughly in the centre. Unfortunately, there are no definitive dates on when some of the band started but we can have a general idea when searching the Trove archive. What is evident, and interesting, is that many local bands appear to have started in the late 1800’s. In the local papers we see little items about performances and meetings – this gives a general clue. In 1887, the Goulburn Evening Penny Post reports on the second performance of the Gunning Town Band where they marched through town to their band room at the railway station (“GUNNING.,” 1887). The correspondent also notes that any future performances of the band “will tend to greatly relieve the dull monotony of things in general” (“GUNNING.,” 1887). Also in 1887 the first pictures of local town bands start to appear as shown below by this early photo of the Yass Town Band. A report from 1890 in the Goulburn Herald makes mention of a Goulburn Model Brass Band however no less than six years later a new brass band is formed called the Goulburn District Brass Band (“Goulburn Model Brass Band.,” 1890; “NEW BAND.,” 1896). This new Goulburn band, and another band called the Our Boys Band were noted for playing Christmas Carols around town a years later (“Goulburn Brass Bands.,” 1897). Further south in the town of Queanbeyan, a Goulburn musician by the name of Harry White was reported to be wanting to start a brass band in the town in 1892 (“Brass Band for Queanbeyan.,” 1892). Evidently, when musicians travelled, their services were sought after and in some cases their reputations preceded them. Coming into the new century there are a few more reports of activities of other local bands. We see there has been a social event to aid the Queanbeyan Fire Brigade Band in 1902 and in 1904 the Bungendore Brass band has been out and about (“BUNGENDORE,” 1904; “Social.,” 1902). 1904 was obviously a good year for bands as a correspondent reported on the creation of a Nimitybelle District Brass Band (“NIMITYBELLE DISTRICT BRASS BAND.,” 1904). The town of Nimmitabel (as it is now known) lies to the south of Cooma on the road to Bombala and although the band was not very big, it obviously elicited a sense of town pride. The picture below shows the Nimitybelle District Brass Band in 1910. Of interest is an article from 1904 reporting on efforts to hold a band contest in Goulburn with the endorsement of the NSW Band Association (“BAND AND MUSICAL CONTESTS.,” 1904). From reading the article we can see that it was going to be a very proper contest with test pieces, a set march, and monetary prizes. The bands of the region acted as formally as possible as these rules from the Bungendore Brass Band tell us (“BUNGENDORE BAND RULES.,” 1912). However, it seems that something had happened to the nearby Queanbeyan Band as they had to hold a meeting to try to get it restarted in 1914 (“QUEANBEYAN BRASS BAND RESUSCITATED.,” 1914). This meeting had a successful outcome regarding the reformation of the Queanbeyan Brass Band and as can be read, a new bandmaster was appointed, and old instruments and musicians called back into rehearsals. In 1913 the construction of Canberra commenced which meant that towns on the railway line became very busy places handling the transhipment of materials and workers (Gee, 2017; Hoffmann OAM & Sharpe, 2013). And while the other brass bands in many little towns and regional centres had already established themselves, Canberra’s band was about to get started. The strength of the brass band movement throughout Australia at that time meant there was no difficulty in finding sufficient players of reasonable competence among the workmen in the city. Rehearsals were held in the Acton Community Hall. In a sense, the reasoning for forming a band is not at all different from the many industry bands that have been created for the benefit of workers. Some months after first article was written, the Canberra Community News published an article on the progress of the new band. The Band has commenced practice, and residents at Acton, it is understood, live only for Monday and Wednesday evenings, when Bandmaster McGuiness knocks the Band into shape with a view to its first public appearance, which is fixed for an early date. Mac. is indeed zealous in the Band rooms, and is so intensely interested that it requires all the persuasive powers of Bob Ellis and others to inveigle him into the ‘bus at the end of the evening. Transportation to and from practices organised by the Commission is working satisfactorily. It is some undertaking to assemble 20 bandsmen from the scattered suburbs of the City. A year later in 1926 the Canberra City Band gained a committee of management to steer the band and it’s written that the band has already presented a number of performances (“CANBERRA BRASS BAND’S CAREER.,” 1926). However, as can be seen in the article, the band had just appointed its second Bandmaster in just its second year of operation (“CANBERRA BRASS BAND’S CAREER.,” 1926). It should be noted that in the band’s first eleven years of operation before it went into recess in 1937, the band went through six Bandmasters (Hoffmann OAM & Sharpe, 2013). Unlike many of the other brass bands around the region, of which the history is harder to find, the Canberra City Band came out of recess in 1947 with William Hoffman OAM as its conductor, of whom conducted the band until 1976 (Hoffmann OAM & Sharpe, 2013). The Canberra City Band survives to this day as a highly successful ensemble. The development of the Canberra City Band could be described as fortunate timing or circumstance. Either way, the city Commissioners recognised that there was a place for a band in Canberra and took advantage of the fact that a culture of brass bands was well-established in many other parts of Australia. As well as this there was the wider development of brass bands in the towns around Canberra in the preceding years which no doubt helped contribute to the development of musicians and conductors. History will tell that the region had a strong banding culture and it is through the early photos and articles that we can see the musical and community life of the region as it once was. 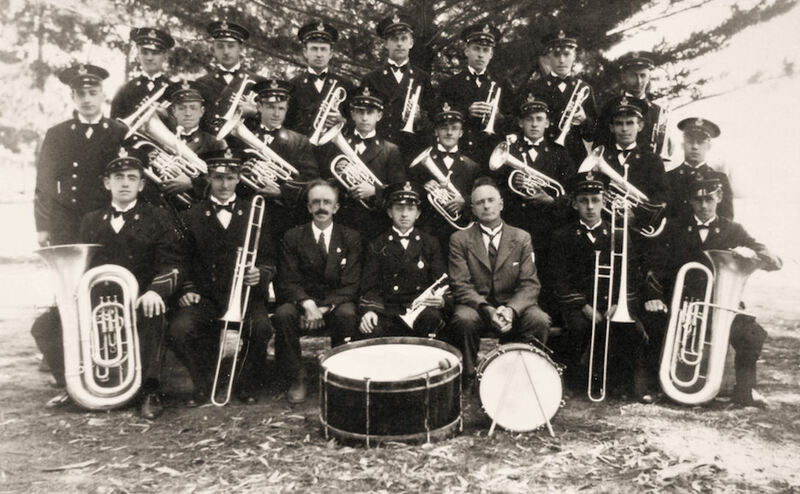 First Bungendore Brass Band [picture]. (1904). Canberra & District Historical Society. Hoffmann OAM, W. L., & Sharpe, J. (2013). Mr Chifley’s baby : the Canberra City Band. Canberra, A.C.T. : Canberra City Band, Inc.
Joe Lyon [picture]. (n.d.). Canberra & District Historical Society. Nimitybelle District Brass Band. 1910. [picture]. (1910). Monaro Pioneers. Portrait of Braidwood Brass Band [picture]. (1914). Yass Town Band, 1887 [picture]. (1887). Whitehurst Yass photograph collection. If we were to undertake an examination of all the aspects that make community bands what they are, and look back over a century, we would probably find that there is much that is similar. In fact, there is not much that has changed at all, except that bands are increasingly adapting to changes in technology when it comes to obtaining the necessities. Our methods of finding sheet music in particular have focused on online searches – we can listen to the music and make discerning choices and music can be purchased, downloaded and printed within hours. Regarding instruments, some bands still maintain stocks although many musicians own their own. Where technology has not really intruded is around uniforms, except for the manufacturing. This is the concern of band committees who have to ensure they have the necessary items for a band while maintaining a workable budget. Change is inevitable. One wonders what the bands of old would have made of all the choice we have now? Throughout this post will advertisements from various firms advertising their products. They were published in a 1919 edition of the Australian Band News and this style of advertisement was quite common. Again, this kind of advertising would be very familiar to the modern bands person. Although we don’t have this kind of banding news is not so common in this day and age, we do have advertising in programs for the National Band Championships for example. The purpose of this post will be to look back in history and view this from a different light where technology was very different, retailers were somewhat aggressive in the way they did things and a number of items were supplied in bulk. There will be the issues of competition between local manufactures and big retailers who supplied imports. We shall see how bands enlisted a whole town to fund them to buy new uniforms as these were a measure of band, and town pride. Regarding sheet music, the bands couldn’t buy just one piece as an amount of music was published in albums. Bands were much more numerous back then and retailers had to keep up with demand. For some this might be a trip down memory lane. For others, seeing the old advertisements might bring a sense of wonder. Whatever you might think, the necessities were as important back then as they are now. A band is not a band without instruments and in the early 1900’s many new bands were busy equipping themselves with whole sets of instruments. With the bands came the industry to support them with many music retailers as they realised that the bands were business opportunities (Evans, 2013). As can be seen below in this 1896 advertisement found in the Sydney Morning Herald, there are a number of retailers listed, including a manufacturer who was based in Australia, John York Jnr. (“Advertising,” 1896). Some music retailers enlisted the services of prominent musicians to endorse instruments – and listing the prizes that were won using particular instruments was a common selling point (Besson, 1919b; Boosey and Co.s, 1919; Myers, 2000). The music retailers worked to build relationships with bands and representatives travelled all over Australia to sell their wares. John York Jnr was one of them and his efforts did not go unnoticed. In 1902 the newly-formed Crokl Brass Band accepted 13 York instruments out of the 15 he sent up to them, although many members of the new band had their own instruments (“Crokl Brass Band.,” 1902). Likewise, the Palings firm, who operated out of Sydney, were famous for supplying whole sets of instruments and the products they sold were enthusiastically written up in various newspapers (“BAND INSTRUMENTS.,” 1889; “BOOSEY’S BAND INSTRUMENTS.,” 1905; “PIANOS & MUSICAL INSTRUMENTS,” 1904). Although, as is seen here, the Queensland Times article from 1905 was more enthused about the presentation of the catalogue! Palings and Allan’s were the agents for many of the brands of brass instruments that were sold in Australia in the early 1900’s and beyond. Instruments from the famous British firms of “Boosey, Hawkes, Besson, and Higham” were imported as their factories were “capable of mass production” (Myers, 2000, p. 176). As such, they could be sold at reasonable prices in Australia which matched those from the British markets (Herbert, 2000). Through some research by Evans (2013) into the history of John York Jnr, we can see that Boosey Cornets sold by Palings in 1904 were “approximately £8” each (p. 74). Such was the prices of instruments in these times. Unfortunately, the importation of cheap British made instruments put John York Jnr out of business. Despite York producing instruments of high quality – he was trained at the Higham factory in Manchester – he couldn’t compete with the bigger music retailers (Evans, 2013). Bands made choices according to their requirements and Boosey’s and Besson’s were generally the instruments of choice. It was not just the local town bands that were benefiting from the business of Palings. In 1914 the 13th Battalion Band, which was still in Sydney at the time, became the beneficiary of a whole set of instruments acquired from Palings by a Miss Margaret Harris and then sent to the Army camp at Rosehill (“BAND INSTRUMENTS.,” 1914). Such donations were not uncommon, and many Battalion bands benefited from individuals donating instruments (“15th BATTALION BAND FUND.,” 1914). Coming into the 1930’s we see that supplying bands with instruments is still a good business for some retailers, in particular the Palings firm who now had multiple outlets up and down the Eastern coastline. A display of instruments by the Palings Brisbane shop at the Maryborough Band Contest in 1932 was enthusiastically written up in a Maryborough Chronical article (“BAND INSTRUMENTS.,” 1932). Regarding the sales of instruments, bands basically went with the retailer that offered the best prices. In 1932 the Lismore Brass Band was trying to acquire some second-hand instruments for loan through the Defence Force, Allan’s and Palings (“CITIZENS’ BAND,” 1932). From the article it seems the terms offered by Allans were rejected and the offer from Palings was examined further. The Woodburn Brass Band accepted an offer from Palings in 1932 for a whole new set of instruments as did the Narrabri Band in 1934 (“NEW INSTRUMENTS,” 1932; “NEW INSTRUMENTS,” 1934). However, things did not always go to plan as the Taree Citizens’ Band found out in 1936 when being unable to afford repayments to Palings, found that their instruments were due to be repossessed (“BAND INSTRUMENTS,” 1936). Such is business! Palings and Allan’s were obviously very helpful to the early brass bands with their sponsorship of competitions and the advertisements swayed some bands to seek them out. No matter how we might view their business tactics, one cannot discount the fact that in the early days, the instruments were supplied when the bands needed them. as the bigger retailers also supplied sheet music to bands. This was also the time of some very famous brass band composers such as Thomas Edward Bulch who not only conducted bands but wrote for them as well (Friends of the Wizard and Typhoon, 2016b; Pattie, 2010). Not much is written about the publishing of band music in newspapers, but there were numerous advertisements for sheet music in publications such as The Australian Band News. To the right, and below these paragraphs are some advertisements from 1919 for sheet music, albums of band music and instruments tutors. In addition to bands obtaining music from albums (or march cards), there were some people within bands who wrote and/or arranged their own music. Certainly, Thomas Bulch was one of them, and his advertisement is below. Bulch conducted his own band in Ballarat for a number of years – the “Bulch’s Model Brass Band” (Pattie, 2010, pp. 5-12) which later became the Ballarat City Band. He also wrote an amount of music, sometimes under his own name, but also using pseudonyms (Friends of the Wizard and Typhoon, 2016b). Bulch worked for himself but at times also worked for Allan’s and Palings as an editor and contributor of music. A list of his compositions compiled by the excellent Friends of the Wizard and Typhoon website can be found here (Friends of the Wizard and Typhoon, 2016a). In a similar way, Robert McAnally, the second conductor of the Malvern and Prahran Tramways Employees Band, also penned up numerous arrangements of existing orchestral works which the current iteration of the band still holds in its library (Stonnington City Brass, 2011). It is fortunate that many bands are able to play this older music today as much of it has survived in band libraries. And that there are old catalogues to look at and admire. The composers and publishers have left the current bands a legacy of music to keep hold of and hopefully play again. Advertisement for the Besson Cornet Tutor from the Australian Band News, 1919. There is no doubt that the old bands wore their uniforms with pride and much has been written about these bands obtaining new uniforms. 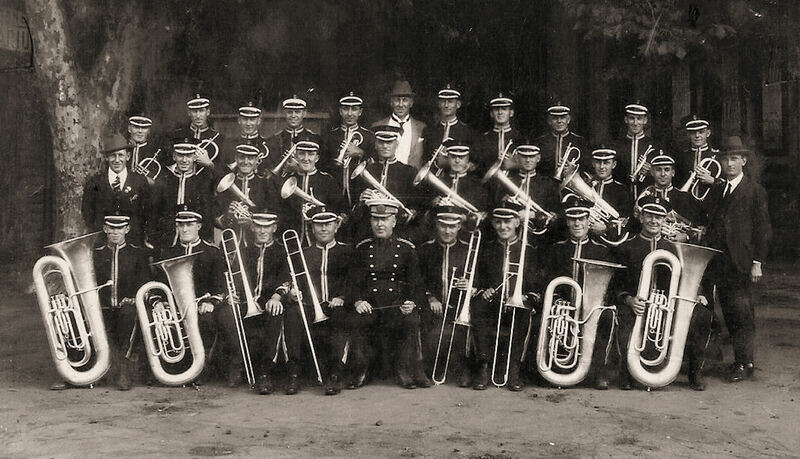 From the metropolitan bands to tiny country bands, in the early decades of the 1900’s, supplying a band with a uniform drew the interest of whole towns and local councils. A look through photos on The Internet Bandsman website shows a huge variety of uniforms and their changes over the years (The Internet Bandsman, n.d.). Being a properly dressed band is one tradition that modern bands adhere to. A brass band composed on insane inmates of the Norriston Asylum paraded about the grounds, wearing uniforms for the first time. They were very proud of their regalia, and when they passed in review of trustees and Physician-in-law Chase, the lunatic who played the big brass horn blew harder and the fat cymbal player, who imagines he owns the State of Pennsylvania, clapped the cymbals with all his might, while the man who beat the bass drum thumped away as if he were trying to knock the drum head in. The uniforms are similar to those worn by the United States troops. When the band stopped playing for want of breath, the lunatics all looked at their uniforms and smiled proudly. There was a bit more to this article but needless to say that the asylum was quite proud of its brass band and the wholistic effect it had on inmates. There is a common thread of funding running through articles on bands and uniforms. In 1905 a bizarre was to be held in the Corowa School of Arts with the aim of funding new uniforms for the Corowa Band (“BRASS BAND UNIFORM.,” 1905). Over in Western Australia, the Katanning Brass Band accepted tenders for their uniforms in 1922 and in 1927 the nearby Gnowangerup District Brass Band decided to look at obtaining uniforms (“Gnowangerup District Brass Band.,” 1927; “Katanning Brass Band,” 1922). The Carnegie Junior Brass Band in Melbourne also decided to raise funds for uniforms by holding a bazaar while the Fitzroy City Council, in a show of support for their local band, calls for tenders for new uniforms (“Carnegie Junior Brass Band.,” 1936; “New Uniforms for Band.,” 1937). Meanwhile, the Salvation Army, as can be seen by the advertisement below, offers its tailoring services to create uniforms for any band that wanted them. Uniforms were a whole different kind of necessity yet brought about great pride to the bands and their towns. It’s no wonder that whole communities supported their bands with these important items. Article for the Salvation Army Tailoring Department from the Australian Band News, 1919. There’s probably much more to be explored regarding instruments, sheet music and uniforms as researching each item brings up more stories. They are part of a much larger story of banding in this country, uniquely so. The fact that the purchase of instruments and production of uniforms made the local papers tells us that the bands (and local communities) saw these as important and newsworthy. It is important that we recognize the lengths that bands went to in order to obtain what they needed. “Allans”. (1919, 26 June). New Band Successes, [Advertisement]. Australian Band News, 12(10), p. 15. Besson. (1919a, 26 June). The Besson Cornet Tutor, [Advertisement]. Australian Band News, 12(10), p. 16. Besson. (1919b, 26 June). Pre-eminent for Over Fifty Years, [Advertisement]. Australian Band News, 12(10), p. 4. Boosey and Co.s. (1919, 26 June). A Famous Soloist, [Advertisement]. Australian Band News, 12(10), p. 18. Bulch & Co. (1919, 26 June). Bulch’s Brass Band Journal, [Advertisement]. Australian Band News, 12(10), p. 9. Evans, A. (2013). Playing on: John York and the Sydney Brass Musical Instrument Factor. Sydney Journal, 4(1), 66-85. Herbert, T. (2000). Appendix 1 : Prices of Brass Band Instruments Extracted from Manufacturers’ Advertising Material. In T. Herbert (Ed. ), The British brass band : a musical and social history (pp. 306-311). Oxford: Clarendon Press ; New York : Oxford University Press. Lyons. (1919, 26 June). Brass Band Instrument Repairing, [Advertisement]. Australian Band News, 12(10), p. 5. Myers, A. (2000). Instruments and Instrumentation of British Brass Bands. In T. Herbert (Ed. ), The British brass band : a musical and social history (pp. 155-186). Oxford: Clarendon Press ; New York : Oxford University Press. The Salvation Army. (1919, 26 June). The Salvation Army Tailoring Department, [Advertisement]. Australian Band News, 12(10), p. 1.